I started TOFFEE-Mocha WAN Emulation software development on 1-June-2016. I took the existing TOFFEE components as a base. Although the TOFFEE-Mocha is entirely an independent fresh Open-Source WAN Emulation solution. Ever since I am in the process of defining and inventing features. So far I come up with the most important feature which is expected to be present in any WAN Emulation software is the packet delay option. First I supported what is called as "Constant Packet Delay" to introduce per-packet (or inter packet) delay in the combination of milli-seconds and micro-seconds. This feature once I fully implemented I tested with file-downloads (via TCP) and bulk ping (ICMP) 1000-bytes packet size and found it is working flawlessly as expected. But what I need is also an innovative feature with which we can control the packet rate based on its size. Such as more delay for a packet which is around 1000-bytes and less delay for a packet which is just around 100-bytes. So I introduced another feature called as "Packet Dynamic Delay". With this feature now I can dynamically control the rate of the packet flow proportional to the size of the packet. And with the packet-dynamic-delay-factor variable you can also adjust its delay factor. Higher the delay-factor set, lower is going to be the packet dynamic delay and vice-versa. 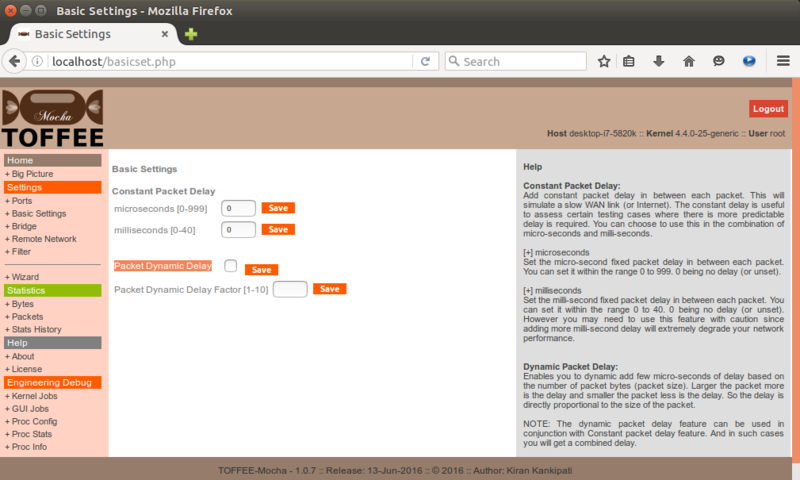 And you can also set delays combination of constant and dynamic packet delay parameters. As one can understand these are cases which we cannot easily configure via any existing Linux tools (user-space and or kernel-space features). And if you need a highly versatile WAN Emulation testing software you need features such as these. I may continue to work on probably couple of more feature before my first TOFFEE-Mocha release which is scheduled on 1-July-2016. Until then stay tuned. If you have any feature requests expected to be supported on TOFFEE-Mocha software you can kindly send me your ideas and suggestions.